Democratic Minority Leader Nancy Pelosi said Saturday there are Democrats in the U.S. House who are open to joining with some Republicans to elect a consensus choice for House Speaker. AUSTIN — Democratic Minority Leader Nancy Pelosi said Saturday that there are Democrats in the U.S. House who are open to joining with some Republicans to elect a consensus choice for House Speaker — similar to how the Texas Speaker of the House is elected. “I think in our caucus there is interest and support, there’s an openness to a bipartisan approach to this,” Pelosi, a California Democrat, said during an on-stage discussion at the Texas Tribune Festival with Washington Bureau Chief Abby Livingston. In recent weeks, outgoing Speaker John Boehner's resignation and U.S. House Majority Leader Kevin McCarthy's withdrawal from the race to replace him have thrown House Republicans into chaos. Some Democratic House members, including U.S. Rep. Joaquin Castro, D-San Antonio, have suggested a moderate Republican could win enough support from a coalition of Republicans and Democrats to be speaker. “I keep saying to my Republican friends, and I do have Republican friends, 'Take back your party,'” Pelosi said, adding that she worried that the House had become "ungovernable" due to constant Republican infighting. The uncertainty over the speakership has damaged the GOP brand in Congress and raised some speculation that control of the House may be in play in 2016, Livingston said. Did Pelosi agree? "I think the Democrats could have the gavel in 18 months,” Pelosi said. She expressed confidence that Democrats would win at least half — and maybe two-thirds — of the 30 seats the party needs to win control of the House. Doing better than that remains a possibility, she added. “Even some pollsters are saying to us, ‘I see a prospect of a wave,’” Pelosi said. One seat that she called a priority is Texas' 23rd Congressional District, currently held by U.S. Rep. Will Hurd, R-San Antonio. Former U.S. Rep. Pete Gallego is running to win the seat back. 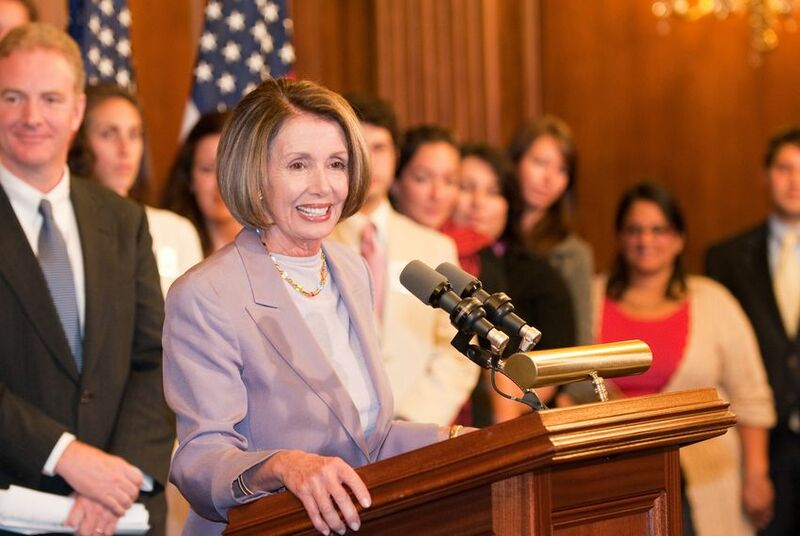 “We are fully invested in Pete Gallego and perhaps some other races,” Pelosi said. While speaking at a theater on the campus of the University of Texas at Austin, Pelosi also touched on the controversial campus carry policy scheduled to go into effect on Aug. 1. Pelosi noted that day marked “the 50th anniversary of the first mass school shooting,” where Charles Whitman shot 46 people, killing 14, from the UT Tower. “People can pass what laws they do, but it is all the more reason to have background checks,” Pelosi said. She also praised the “remarkable and courageous stand” taken by some faculty members against implementation of the law. Livingston asked Pelosi if she would have concerns about one of her grandchildren, three of whom live in Houston, attending UT or another public university in Texas with a campus carry policy in effect. Pelosi said her grandchildren have mentioned interest in attending UT. On Vice President Joe Biden, and whether he might make a run for president, Pelosi said she was out of the loop. But Pelosi took the opportunity to take a slight dig at the Republicans running for president.